Two blueprint-specific benchmarks provide formative assessments to analyze and then reteach or remediate preceding the STAAR assessment. 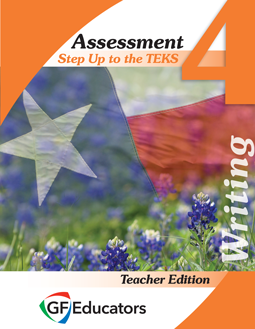 Four assessments encompassing all the STAAR Writing TEKS for fourth and seventh grade, are available to use as Curriculum Based Assessments at the end of each grading period. Each assessment presents an expository writing prompt. An answer key links each question to the assessed TEKS. The Teacher Edition includes an item analysis for each question on the assessments and is designed to enable each assessment to be used as a teaching tool after test administration. View a Sample of the 4th Writing Assessment Teacher Edition by sending an email to info@stepupteks.com asking for the password. Accompanies the 4th Writing Assessment Student Edition.